check For fire evacuation and access. check Opens in seconds from multiple predefined heights/floors. check Disappears into the building like a downspout. 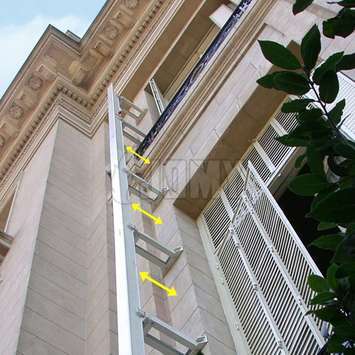 The most popular variant of our retractable ladders. 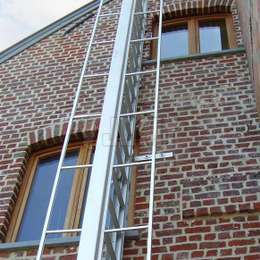 Engineered to our highest standards by our own design bureau first in 1968, the lightweight 100% anodized aluminium JOMY Ladder can widthstand an incredible charge of up to 5,000 Kg (71 average weight adults)! 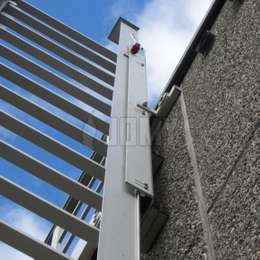 It is the most robust retractable ladder on the market. 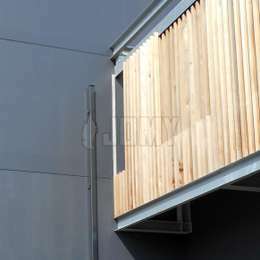 With JOMY's contemporary and refined design, architects and builders have an unobtrusive way of providing a reliable means of egress and access to their creations. With the looks of a slim downspout and available RAL color options, the JOMY vertical ladders will compliment every design. With multiple independent opening handles, the JOMY foldout ladders are designed to perform on every level, at every level. With a one-hand smooth opening mechanism, they provide everyone with the reassurance needed in crucial moments like an emergency. 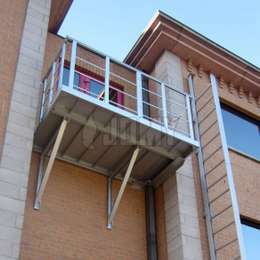 The use of marine grade anodized aluminium and a weatherproof box-section design garantees a year-long well-functioning ladder. 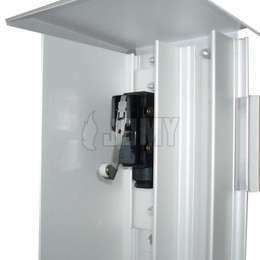 Add a unique guardrail design, optional lifeline and a tamper-proof lockable mechanism and you are sure to have the best solution at hand. Recommended use Evacuation and access. 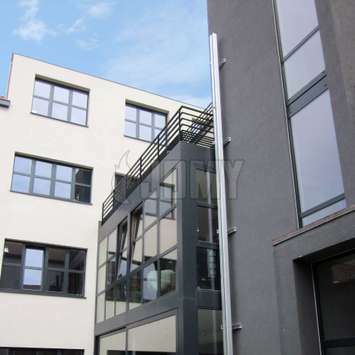 Maximum height Up to 30 m or 100 ft (and higher if needed). Opening mechanism Multiple independent opening handles. 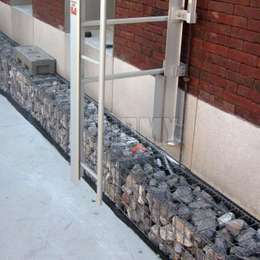 Permitted charges Rungs: 1000 lb or 450 Kg. Ladder total: 11000 lb or 5,000 Kg. Attachments Standard, one attachment every 5 ft or 1.5 m.
Optionally, with reinforcement profile, one attachment every 10 ft or 3m. Fixed lifeline for fall protection Optional. 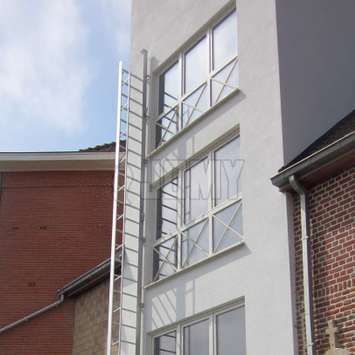 Based on popular needs and to help you choose the one that fits you the most, we have gathered hereunder the most common configurations of the JOMY Ladder . 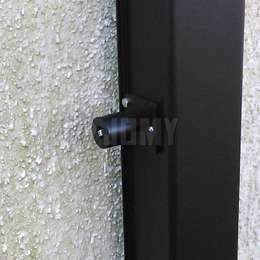 Our different mounting brackets allow for the ladder to be securely installed even if facade decorations, exterior window sills or technical wires and tubes are in the way.